Can a Grim Reaper Survive Eleventh Grade? As a Reaper, it is Mary’s duty to guide the dead to the afterlife. For the past 50 years her assignment has been to retrieve souls in terrifying war zones. When a simple mission pushes Mary to her breaking point, the deity of the Reapers banishes Mary to the mortal world. As everything she’s ever known is turned upside down, Mary is forced to leave her past behind and open her heart. She realizes that all Humans aren’t as terrible as she believed, but some are worse than she ever imagined. The Kindle Scout Campaign has begun for my debut YA Novel, Becoming Human. If you would like to see this book published by Amazon Kindle and shared with the world, please nominate me on Kindle Scout. 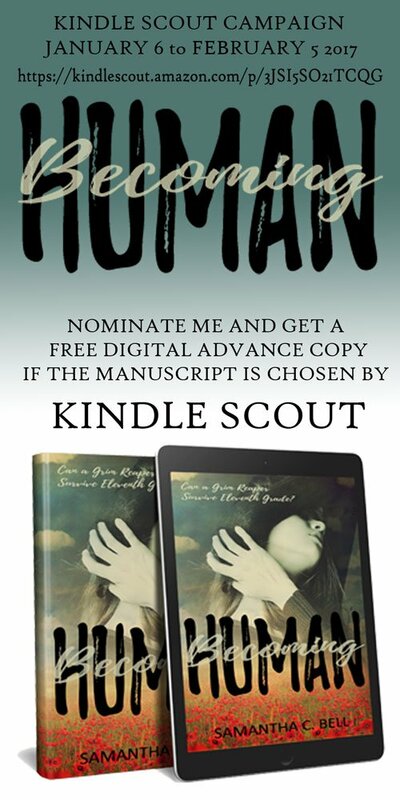 (https://kindlescout.amazon.com/p/3JSI5SO21TCQG) If you nominate Becoming Human, and if it is selected you will get a FREE DIGITAL ADVANCED COPY! Follow me on Twitter for 30 days of Q&A while the campaign runs!